Today we are in one of my favourite places, Madison Wisconsin. Ever since I woke up this morning, one of my favourite Hindu Gods, Ganesh has wanted to be with me. When I chose my clothes this morning I chose my Ganesh Squeezed Bamboo top, my Ganesh Squeezed scarf, and a Ganesh bracelet that Namaste Yogi and member Linda Wiley-Perez had gifted to me a while back. Ganesh is the God that you call in at the beginning of a journey. He is also the remover of obstacles. This mudra that we are going to do today is known to bring courage and strength. I’ve felt like I need that courage and strength today. Today is the official closing day for our house. I know everything is going to be ok, but this is a pretty big deal too. Letting go of our home of over the past eleven years without another home to go to is a big act of trust. In his upper right hand, Ganesh holds a goad to help propel us forward on our path and remove obstacles on our way. Ganesh certainly has done that for us so far. He helped us sell our house in just two days. He has given us a home in one of our Namaste Yoga members to stay with until we find our own home in Victoria (thank you Char!). Ganesh holds a noose in his left hand to capture all difficulties, so on today, the day of the closing of our house, I know he will look after any last minute details. 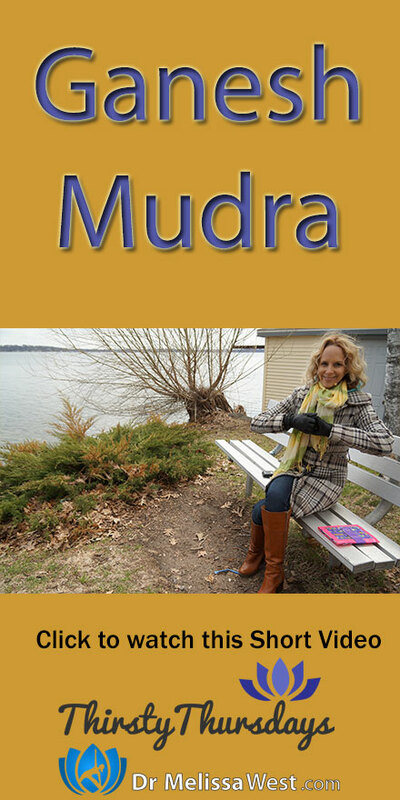 The Ganesh mudra is the first mudra in Getrud Hirschi’s book Mudras: Yoga in Your Hands and so it is one of my first mudras for mudras on the move as well. Today I invoke it for courage, confidence and openness to the opportunities that lie before us. Affirm: Thank you Ganesh for the courage, strength and confidence to follow through on my dreams and for removing all the obstacles on my path.